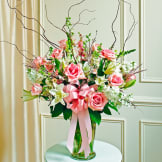 This tribute beautifully reflects all the love and sympathy in your heart. 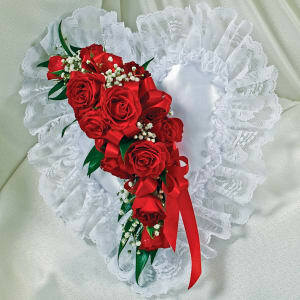 • This satin casket pillow — in the shape of a heart — is adorned with red spray roses, baby’s breath, satin and greenery. • This particular style of tribute is often sent by children or grandchildren and delivered directly to the funeral home.